Peter Hopp's "Joint Slide Rules"
For hundreds of years, the slide rule has been a useful calculating device. 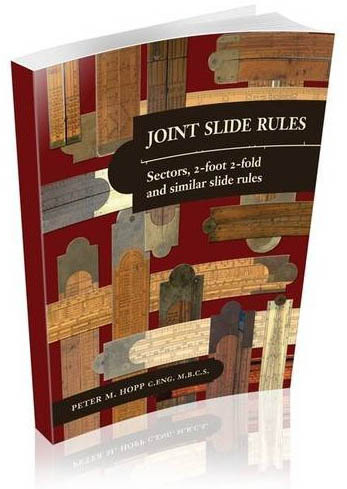 In his second book, Joint Slide Rules: Sectors, 2-foot 2-fold and similar slide rules, expert Peter M. Hopp examines the joint rule, completing an important but neglected part of slide rule history. The book is a comprehensive account of joint rules and contains detailed information on over two hundred joint slide rule makers from around the world. Calculating devices that preceded the slide rule, such as sectors and timber rules, are examined, as are special joint rules that incorporate additional elements, such as callipers. Special jointed devices, such as dip rods that allow calculation, are also included. With the addition of over one hundred detailed illustrations of joint slide rules and a glossary of terms, this book is essential reading for anyone interested in joint slide rules and their history.